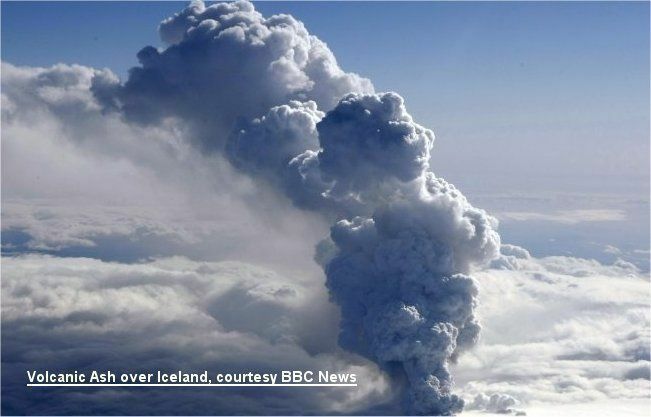 On Wednesday, April 15th, a plume of smoke emitted by a volcano under Iceland's Eyjafjallajokull glacier carried dark clouds over the country of Iceland, which quickly blew across the Atlantic to settle over the United Kingdom. Because the clouds carry a particulate matter that can damage airplane engines, all traffic in and out of U.K. airports was immediately grounded. As the clouds moved across the European landmass, many more flights were cancelled. On 17 April, KLM and Lufthansa sent test flights out through the cloud of silicate gel, and neither flight suffered any damage to its engines. European air carriers have been lobbying the air traffic control regulators to allow them to resume flying. Although some flights have resumed as of April 20th, travelers can expect all air traffic in the U.K., Europe and Scandinavia to be delayed due to the ripple effect of having aircraft in the wrong place at the wrong time. According to reports, the Mid-Atlantic Ridge where Iceland is located is an active volcanic zone, but the country's frequent eruptions often strike in little developed areas and haven't many residents or their property. This is the second minor eruption from this volcano outside of Rekjavik in the past month; previously, it had been dormant since 1821. Scientists do not know how long the activity will continue but have expressed concern that it may trigger an eruption of Mt. Katla, a much larger volcano in Iceland. According to interviews with FAA officials, there is no estimate as yet for when airports in these affected countries will be able to reopen. The current worldwide disruption of air travel is said to be more widespread than after the 9/11 attacks over U.S. airspace. Airlines are working together to move passengers to their intended destinations as efficiently as possible and several travel insurance companies are covering flight delays due to "weather" reasons. Iceland Air, for example, whose schedule has been severly disrupted, will not be charging any penalties or change fees and will refund tickets, fully refund vacation packages, or rebook flights without penalties, as long as plans are made within a 14-day window from the original travel date. See http://www.icelandair.us/specials/pages/global/ticket-refund/ for more information. The Icelandair Group has set up a Volcano Information Service for the most up-to-date information on the current status of the volcanic activity and its affects on air travel. Please check the flight status on your airline's website for the latest information on your flight before you travel to the airport.